(PhysOrg.com) -- Studies done by Mark Lusk and colleagues at the Colorado School of Mines could significantly improve the efficiency of solar cells. Their latest work describes how the size of light-absorbing particles--quantum dots--affects the particles' ability to transfer energy to electrons to generate electricity. The results are published in the April issue of the journal ACS Nano. The advance provides evidence to support a controversial idea, called multiple-exciton generation (MEG), which theorizes that it is possible for an electron that has absorbed light energy, called an exciton, to transfer that energy to more than one electron, resulting in more electricity from the same amount of absorbed light. Quantum dots are man-made atoms that confine electrons to a small space. 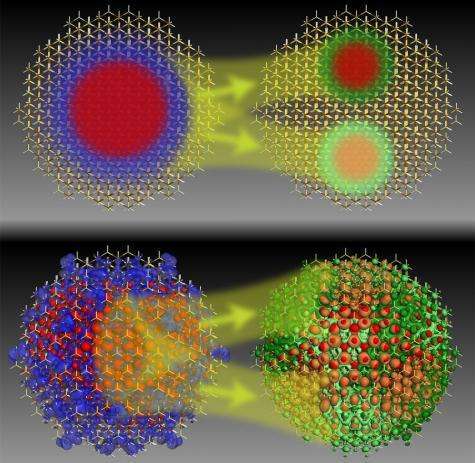 They have atomic-like behavior that results in unusual electronic properties on a nanoscale. These unique properties may be particularly valuable in tailoring the way light interacts with matter. Experimental verification of the link between MEG and quantum dot size is a hot topic due to a large degree of variation in previously published studies. The ability to generate an electrical current following MEG is now receiving a great deal of attention because this will be a necessary component of any commercial realization of MEG. For this study, Lusk and collaborators used a National Science Foundation (NSF)-supported high performance computer cluster to quantify the relationship between the rate of MEG and quantum dot size. They found that each dot has a slice of the solar spectrum for which it is best suited to perform MEG and that smaller dots carry out MEG for their slice more efficiently than larger dots. This implies that solar cells made of quantum dots specifically tuned to the solar spectrum would be much more efficient than solar cells made of material that is not fabricated with quantum dots. According to Lusk, "We can now design nanostructured materials that generate more than one exciton from a single photon of light, putting to good use a large portion of the energy that would otherwise just heat up a solar cell." The research team, which includes participation from the National Renewable Energy Laboratory, is part of the NSF-funded Renewable Energy Materials Research Science and Engineering Center at the Colorado School of Mines in Golden, Colo. The center focuses on materials and innovations that will significantly impact renewable energy technologies. Harnessing the unique properties of nanostructured materials to enhance the performance of solar panels is an area of particular interest to the center. "These results are exciting because they go far towards resolving a long-standing debate within the field," said Mary Galvin, a program director for the Division of Materials Research at NSF. "Equally important, they will contribute to establishment of new design techniques that can be used to make more efficient solar cells."